The city of Bath is historically in awe of its own heritage. The World Heritage Site is perhaps best known for its Roman hot-spring baths and its distinctive Palladian architecture. 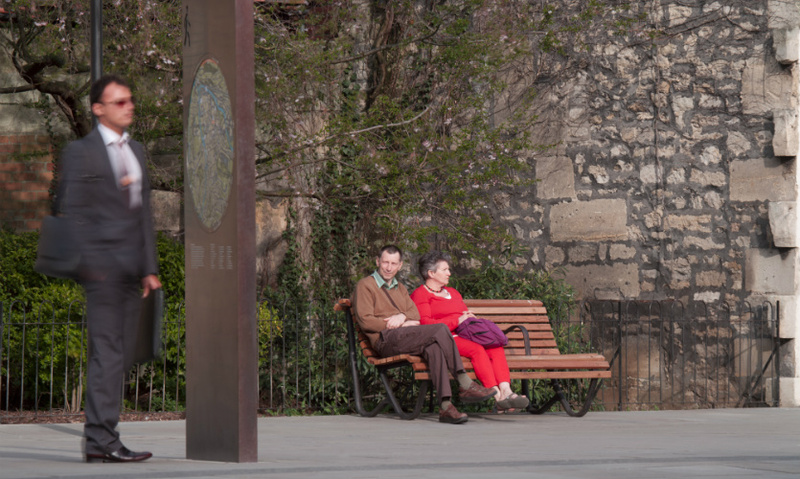 Its modern-day residents take their city’s cultural heritage very seriously, and any new features added to Bath’s streets are often viewed by those who live there as a form of cultural vandalism. 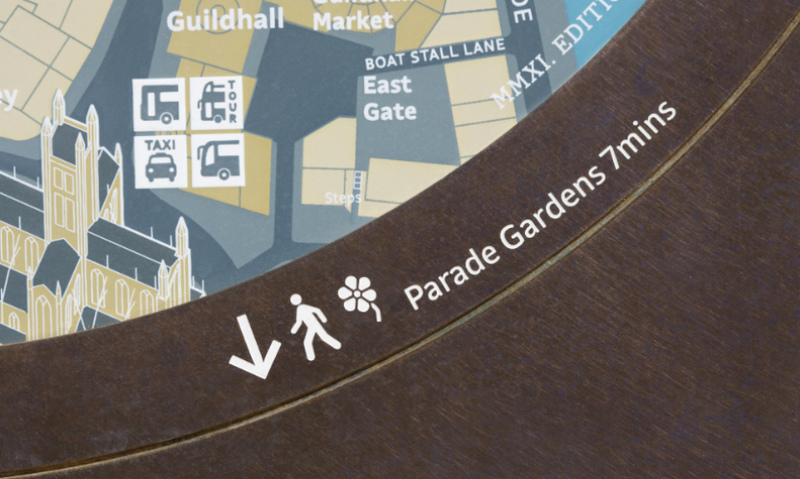 Within this context, PearsonLloyd (in collaboration with CityID and FW Design) developed a new pedestrian wayfinding system that respects the city of Bath's rich historical legacy but is a bold and contemporary addition to its 21st-century fabric. After many years of cultural conservatism, a new strategy entitled “Creating the Canvas for Public Life in Bath,” was adopted, aimed at remodeling the city of Bath’s streets and spaces and helping to revitalize the economy, identity, vitality, and relevance of Bath and its environs as a living 21st-century city. The project’s key challenge was to develop designs with an aesthetic that would allow Bath to express itself as a contemporary city while remaining in harmony with its extraordinary, picturesque heritage. 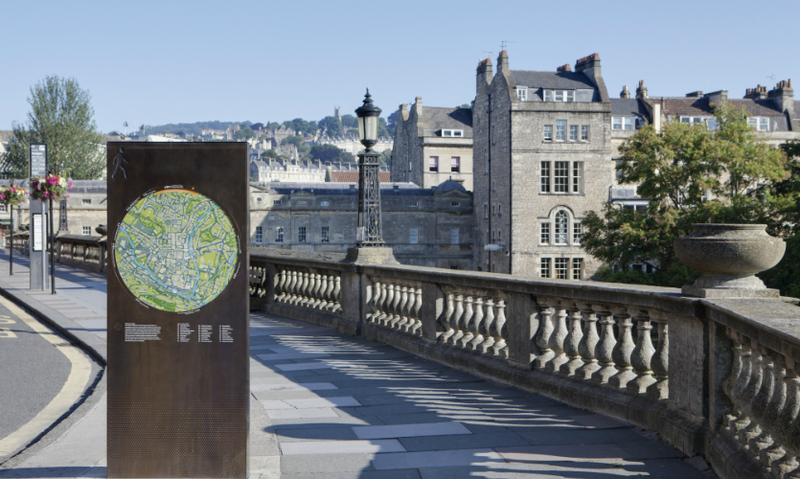 When establishing how best to design a wayfinding system that would communicate practical information while encapsulating Bath’s existing character, PearsonLloyd found the solution in the geometric forms beloved by the architecture of the 18th century and the Age of Enlightenment. 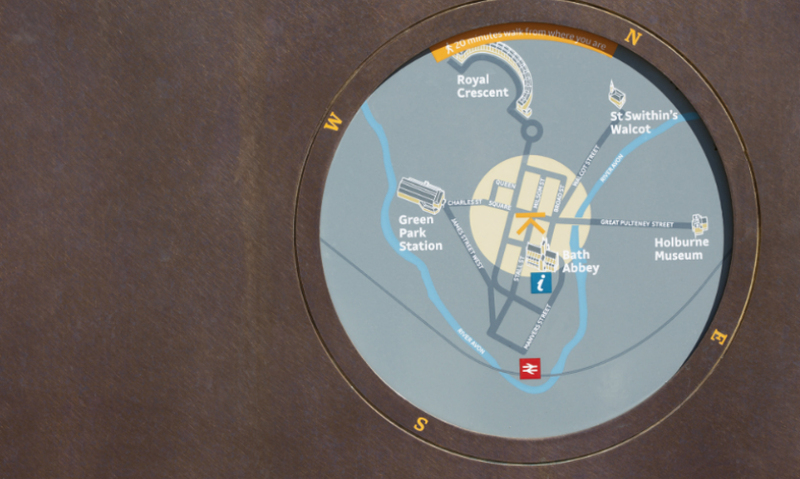 The final design is a circular, vitreous enamel map set within a bold, bronze monolith. The round enclosure references traditional scientific instruments, such as the compass, lens, and sundial; it also echoes the local topology, as the city is encircled by hills. City ID and FW Design developed a user-focused wayfinding strategy that considers the entire journey, from pre-journey planning to enroute information and on-street wayfinding. The resulting mapping system encourages discovery of the city at two scales. 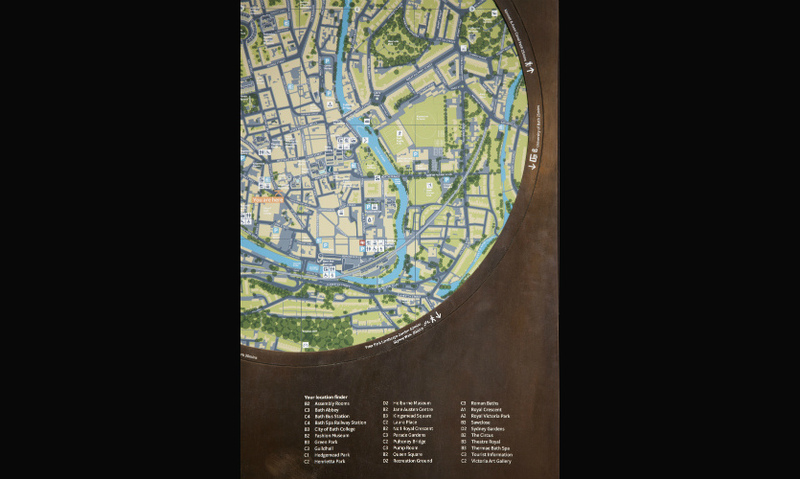 Pedestrian maps reveal the city by zooming in on detail, while a locator map provides a consistent reference to the wider city center. At key decision points throughout the city, “Pedestrian Orientation Points” reveal additional layers of detail and information. 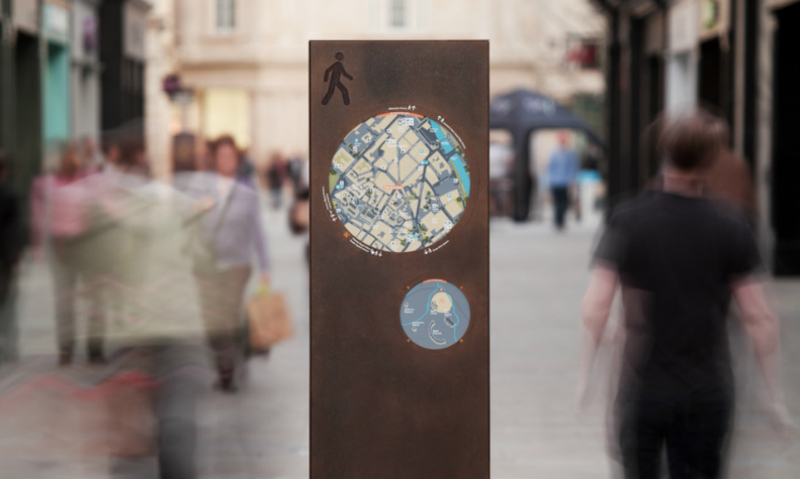 Bath’s visual identity and DNA is delivered through a range of graphic components that capture the essence of the city’s heritage and future. Within a unique set of illustrations and pictograms, the typeface and color palette were inspired by the elegance and beauty of Bath’s Palladian architecture. The design’s success is also attributed to the material selection of bronze and vitreous enamel, which deliver key design values of craftsmanship, attention to detail, and quality. 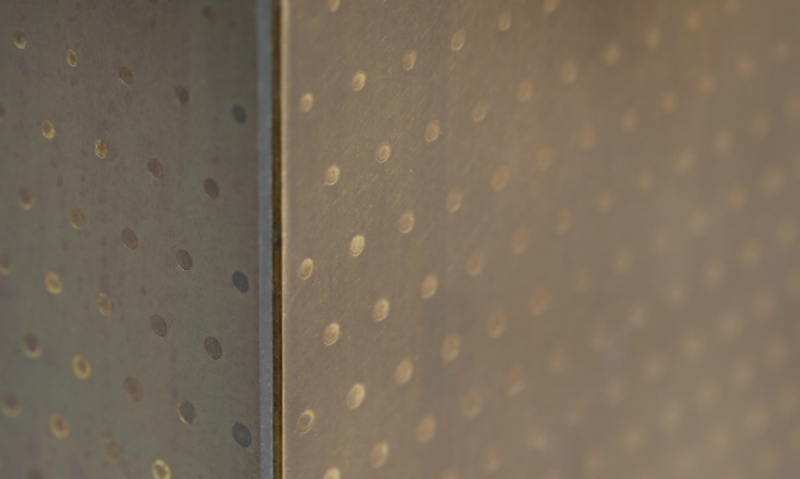 Although man-made, bronze has an authenticity that complements Bath’s local stone and slate roofs, and has both practical and aesthetic advantages: It’s easy and cheap to maintain, acquiring a beautiful, rich patina over time. 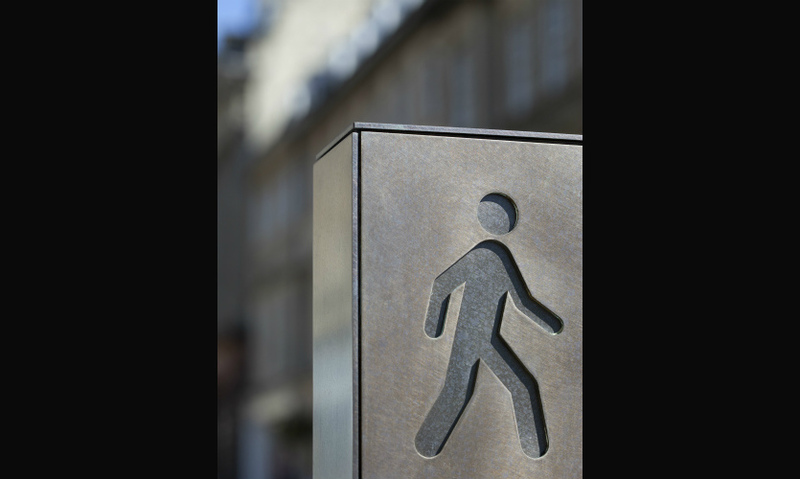 The wayfinding monoliths are complemented by several city-center bus shelters that share the same, bold, bronze aesthetic and have a powerful, modern presence in Bath’s otherwise traditional streetscape. 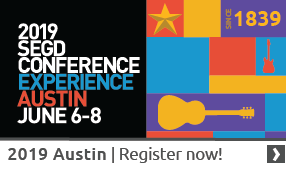 Find content in your area of interest in the SEGD XPlore Experiential Graphic Designindex.